texas department of criminal justice | Out of the Box! The Texas Department of Corrections Ephemera collection (1881-2013; one box) contains newspaper clippings and booklets concerning the state prisons of Texas. The collection’s main focus is the Texas Department of Corrections. The newspaper clippings in the collection come from the Huntsville Item newspaper and various other Texas publications. The booklets in the collection are primarily informational materials printed and distributed by the Texas Department of Corrections. The collection materials concern many Texas prison subjects including: prison personnel, prison administration, facilities, inmates, death row, and prison industry. View a detailed finding aid of this collection at Sam Houston State University’s Finding Aids Online page and see just what materials are in the collection. 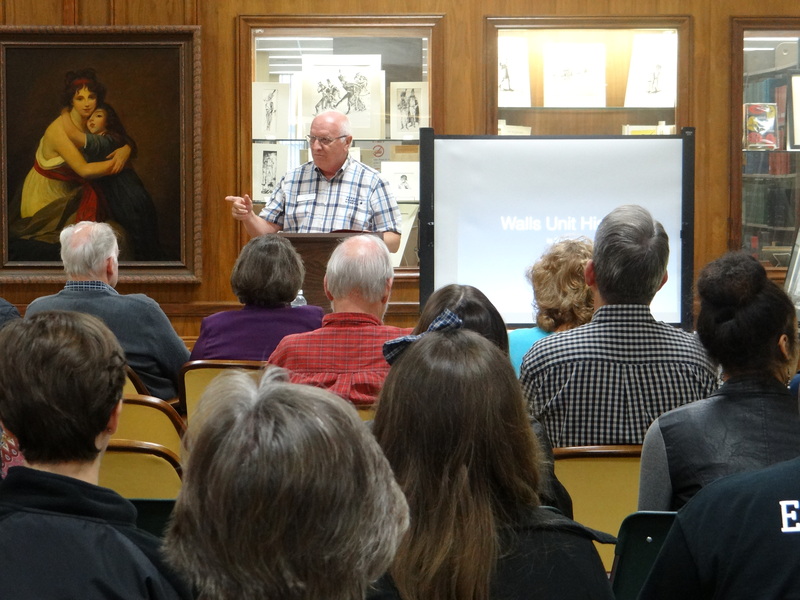 On November 5, 2014, Director of the Texas Prison Museum and Former Warden of the Walls Unit Jim Willett spoke in the Thomason Room at Newton Gresham Library on the history of the Huntsville Unit a.k.a. the Walls Unit. 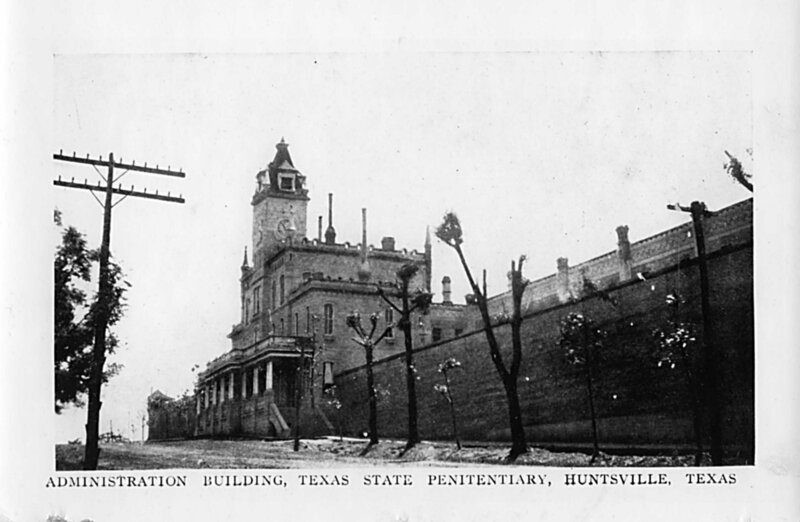 Students, faculty members, and residents of Huntsville were regaled with stories that reflect the complex nature of the oldest prison in Texas. As an example, some escapees dug a hole under the Walls only to run into the wife of the warden who shot at them, leading to their capture. In another story, a judge gave directions that a prisoner be kept in solitary confinement in a cell painted black on the inside and outside without provision for exercise. Notably, the prison officials noticed that the prisoner’s health was deteriorating and made provisions to move the prisoner out of isolation. Willett did a wonderful job presenting the complex history of the Walls, giving the audience a better understanding of a building that looms large in the history of Huntsville, TX. After his talk, Willett fielded questions from the audience that ranged from asking about his experience overseeing executions, the relationship between prisoners and his family, and the history of property owned by the Texas Department of Criminal Justice. The event unfortunately only lasted an hour with Willett still having more stories and facts to detail. Hopefully we can have him back soon. If you could not attend, but would like to know the contents of the talk, you can view our Twitter account at @SHSUArchives or search #WallsTalk. The Texas Criminal Justice Newspaper Clipping Collection (1864-2011; three boxes) contains newspaper clippings concerning criminal justice in the state of Texas. The collection’s main focus is the Texas Department of Criminal Justice and includes many articles from the Huntsville Item and various other publications. The Texas Criminal Justice Newspaper Clipping Collection contains many Texas prison subjects including: death row, prison personnel, prison administration, facilities, escapes, convict labor, the prison rodeo, court cases, corruption, and female inmates. 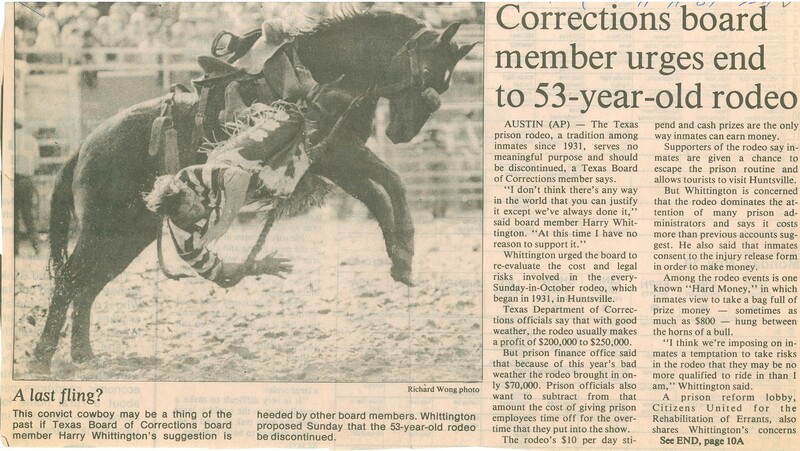 The picture featured above is an article from the Huntsville Item concerning the possible ending of the Texas Prison Rodeo which was held in Huntsville, TX. View a detailed finding aid of his collection at Sam Houston State University’s Archon page and see just what materials are in the collection. Every day the Texas Department of Criminal Justice houses, transports, and supervises over 150,000 inmates making it the second largest prison system in the nation. The inmate population exploded in the early nineties due to stricter laws and stiffer penalties in Texas courts. Penitentiaries are undoubtedly a big business in Texas and the average person can be unfamiliar with life on the inside. Fortunately, Prison 101 by Mark Bull is just the book for anyone who may be interested in Texas prison life and culture. Mark Bull graduated with a B.S. in Criminal Justice from Sam Houston State University an Associate Degree in Industrial Security from the Community College of the Air Force. Bull was a supervisor for The Texas Department of Criminal Justice and has been a consultant for jail and prison management. Prison 101 was designed as a pre-incarceration orientation for soon to be big house residents and covers many penitentiary topics both expected and unexpected. 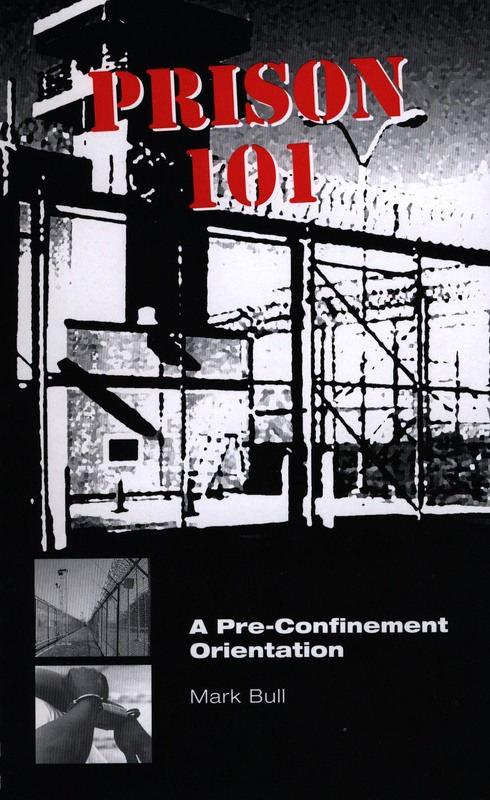 This interesting and hard-to-find paperback addresses prison survival, including inmate tricks and games, dangerous situations, and hoosegow terminology. Even if someone is not on their way to the penitentiary, Prison 101 gives insight into the dangers lurking behind those razor wire fences. The book provides vital information for the prison bound and even covers what to expect if you have family that may be incarcerated. Prison 101 can be found in the Thomason Room CJ Special Collection. Trent Shotwell is a Library Assistant in Thomason Special Collections at the Newton Gresham Library. He previously worked for the Texas Department of Criminal Justice for 3 years and the Texas Prison Museum for 9 years.